Le Isole is an elegant family-run B&B on the enchanting island of Ischia, a unique place where peace and quiet reign supreme. The B&B was born from a desire to relive the time when the house was enjoyed by the owners’ family, to share the experience of happy summers at sea and the fragrances, landscapes and colours which characterize the island of Ischia and make guests feel right at home. Nestled between the famous Via Borbonica and Via Spinavola, Le Isole is immersed in the unspoiled nature of Forio d’Ischia and is only 600 metres from the famous La Chiaia beach. 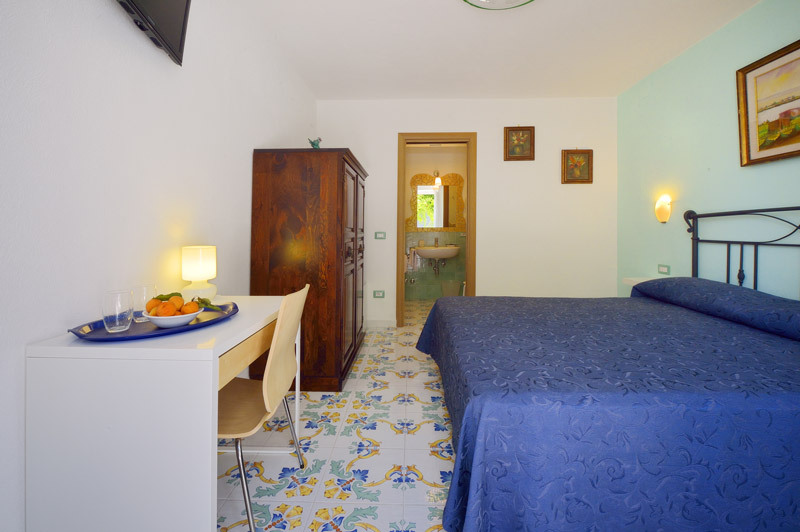 The B&B enjoys an ideal location only a few metres from the beach, also allowing guests to visit the entire island of Ischia, its harbours and thermal baths with ease. Recently refurbished, it features typically Mediterranean styles and colours and offers three bedrooms named after the islands in the Gulf of Naples: Capri, Ischia and Procida. There is a bus stop next to the B&B for guests who wish to enjoy a completely relaxing stay, avoiding the stress of driving. Attention to detail, hospitality and a welcoming atmosphere make the Bed & Breakfast Le Isole a magical place for an unforgettable holiday. B&B Le Isole can satisfy all of its guests’ needs thanks to the professionalism of its staff and the several additional services on offer. B&B Le Isole has partnered with the best local providers to offer its guests a full range of services and make their stay unforgettable. The B&B offers a buffet breakfast, served outside on a large communal table. This setting was chosen to help guests feel like they are part of a family and give them a chance to socialise with each other. The beautiful and evocative garden features fruit trees and colourful plants, and is available for all guests to sunbathe, read a good book in the shade or enjoy a well-deserved rest. Wi-Fi is available throughout the B&B, for guests to share their relaxing moments and holiday highlights with their friends and stay connected to everyday life.